I got the hull all prepped and ready for paint last week and then got up early Saturday and got four good coats of polyurethane paint sprayed on the bottom , one or to runs that I will sand and buff out but got a nice shine . Will let it set up for a week and then flip and get the top painted . Momma's '66 G3 had a similar color blue deck underneath all the paint jobs back when we rebuilt hers. Thanks for posting all your progress! Thanks Doc , Hope to flip tomorrow so I can get started on the top . Cannot wait to finish painting so I can start rigging . Wish you were on this side of the country I would love to visit your shop. It is coming along very nicely Hogify. Looking good. There are many of us would like to be closer to The Doc and his Magic Mercshop! Got the painting finished last night and came home from work today and took some pictures of the results . Will let sit for a day or two and then will start putting it back together. Had the trailer sand blasted and painted and pulled the boat on the trailer. Starting to install hardware , made the motor mount and finishing up the wiring. 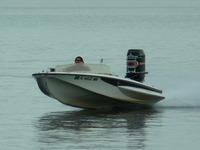 Had a friend give me a boat that has a 150 tower that has not run in two years but was winterized before storing , will try tomorrow to get it started . Really looking GOOD!!! Hope the motor works out for you. Thanks Gene Hooked a battery to the tower tonight turned the key and choked it and it fired right up . Got it of the boat and repainted ready to install tomorrow . Wiring from the control box to the motor was pretty bad and will have to replace most of the wires .Hope to get everything finished for a launch next weekend. I love the added pin-striping between colors! You're gonna have your hands full with the 1500, so be careful. Beautiful job on that boat!! Take Doc F's advice on "be careful" with that much horsepower. 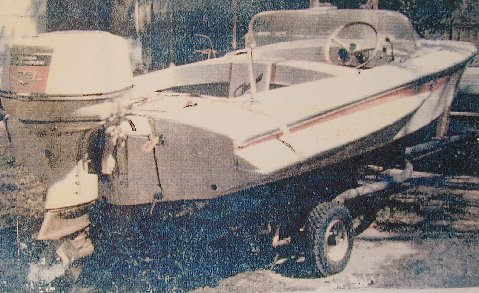 I ran and raced 1960 G-3 with 75 hp Johnson from 1960 to 1977 and bought and restored another 1960 model in 2004. The one I have now has a 1969 Merc 1000 on it and I clocked it at 56 mph and it had more, BUT it was getting tooooooooo squirrely above that speed! I drove a friends G-3 with a Merc 150X up to 68 mph, and the torque was taking the wheel away from me!! Oh, where do you live? 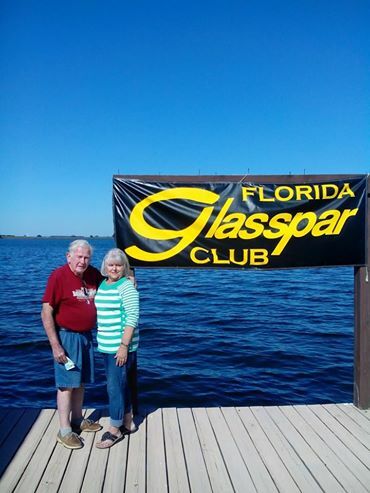 I am in Florida and we have many G-3s in our Florida Glasspar Club. Thanks Jim and Doc , I will be careful , the plan was to only put the 90 merc on it but I have not finished putting it back together . This motor I got for nothing and it runs so I just put it on . 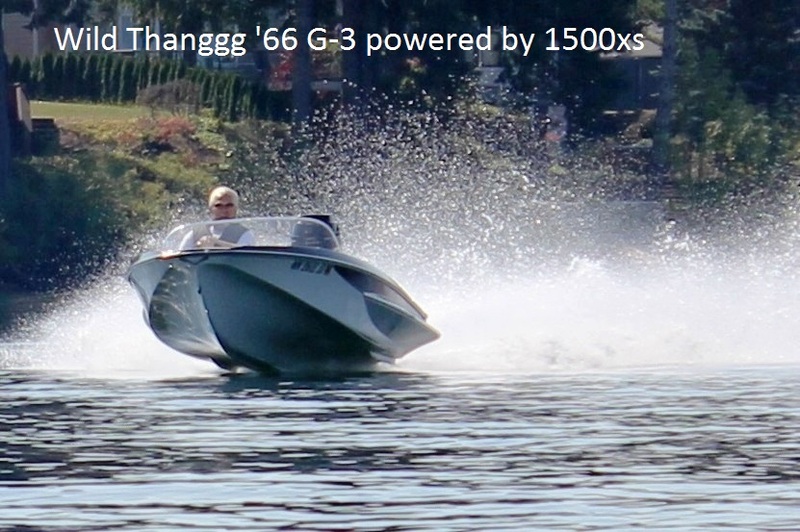 I have a shot at an 80s 90hp with trim and tilt and I would like to put it on . Finish mounting the 150 on the bracket tonight hope to hook cables tomorrow night . Still have a lot left to finish but would like to get it wet . Got Snoopy wet for the first time today . Motor ran ok although I was only getting about half throttle and that was with pushing down full on the hi speed idle stick . I either have a bad cable or screwed something up in the control box , will look later when it cools down. Here are two pictures sitting in the water . She looks great in the water! "Motor ran ok although I was only getting about half throttle and that was with pushing down full on the hi speed idle stick." You shouldn't be able to speed up the engine in Forward gear or Reverse by using the small high idle lever. That should just work in Neutral. It is possible that either the spring loaded button that should keep the small lever down in gear might be worn out - or something else is fubar in the control box. Dis-connect the control cables at the motor and see how the control box works then. Lots of other things come to mind, but I'd start there. Thanks Doc , took the box apart today and found that the cable was binding at 3/4 throttle not in the best condition , will order a new one Tuesday will check the spring and clean up the box . Cannot do to much to it this week trying to get a pontoon boat ready to take north next weekend .
" WOW " had a problem all week no spark thought it was the switch box , but I read some old posts and read a lot about the trigger so this morning a switch out distributors and instantly had spark again , old distributor was pretty green inside , also got the tilt and trim working . Took it out for a quick ride and had the wife come and take pictures . Real rough and windy so I could not really open it up and motor needs to be jacked about 1 or 2 inches . Was a wild ride like the 150 but I think after the summer I will look for a nice 75hp , think it will make it alittle less wild but still a lot of fun. Makes me want to bring ole Wild Thanggg back to life. You will find that the 4 cyl 75, 80, or 850 will be a perfect match for the G3. The OMC 3 cyl 75-85 would also be a good candidate, but I'll deny I said anything nice about an OMC. I agree with the "Doc" on motor size. Your boat looks very, very nice!!! NOW, where in Florida do ya live??? I am south of Tallahassee 12 miles.